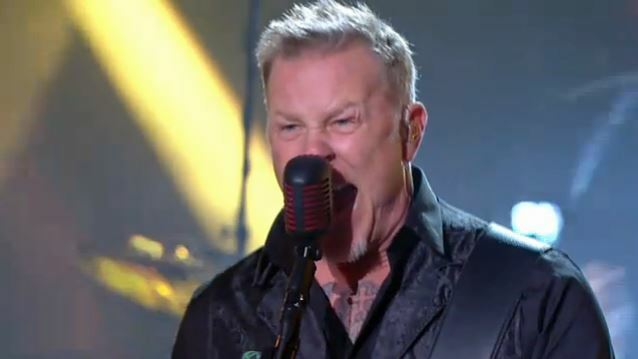 METALLICA took part in an interview and live performance on the November 15 edition of "Le Grand Journal", a French nightly news and talk show airing every weekday evening on Canal+. You can now watch video footage of their appearance below. METALLICA celebrated the launch of its new album, "Hardwired... To Self-Destruct", with what was being billed as a "very special and intimate live performance" on Friday (November 18), the day of the CD's arrival. The concert in front of 350 lucky fans was livestreamed around the world from House Of Vans in London, England. "Hardwired... To Self-Destruct", a 2-CD / 2-vinyl set, is METALLICA's first studio album since 2008's multi-platinum "Death Magnetic". Greg Fidelman, who engineered and mixed "Death Magnetic", produced the album. Instead of a previously announced bonus disc of demos, the deluxe edition of the album features a number of cover songs that the band has recorded over the past few years, including a medley of Ronnie James Dio songs, IRON MAIDEN's "Remember Tomorrow" and DEEP PURPLE's "When A Blind Man Cries". The deluxe version also features a live set recorded at Rasputin's in Berkeley, California on Record Store Day 2016 and a live version of the new song "Hardwired" recorded in August at U.S. Bank Stadium in Minneapolis. Drummer Lars Ulrich told The Pulse Of Radio about the METALLICA songwriting process: "We have all these riffs and it's kind of puzzle-like. We just sort of go through, you know, that process and continue to revisit and 'Oh, wait a minute, that's really cool the way those two fit together but it doesn't really work with that other thing, so why don't we take those two and put them with that other thing, you know, Number Seven from over here' or whatever. So that's very much our process and we just sort of keep going through it until it sort of eventually turns into songs."